Do you want to start learning how to be more handy? If so, click here to find out about 5 easy home repair ideas you can try yourself. Any homeowner will tell you that there are always home repairs that need to be done. Home repairs don’t have to cost you an arm and a leg though. In fact, there are plenty of home repairs that you can do yourself. That’s right. The only thing these repairs will cost you is parts and maybe some sweat equity! We’ve all been there before. When you have a clogged toilet, take a deep breath, grab your plunger, and get to work. Don’t freak out; chances are, you can get this fixed up quick on your own, without calling in a professional. First, make sure nothing out of the ordinary got flushed. If that’s the case, you might be able to get it out with your hands (wear gloves!) or by dumping in water to dislodge the object. Other clogs can be removed with plungers or if the clog is really bad, a plumbing snake can be purchased at any home improvement store. Most of the time, leaky faucets need new seat washers. To replace them, pry off the cap on the faucet handle, remove the screw holding the handle on, pull off the handle, and use a crescent wrench to unscrew the nut. Then, remove the washer and replace it with a new one. Follow the same steps, but in reverse, to put the handle back together. We’ve all found ourselves with holes that need to be patched. Maybe you were a little indecisive in your picture hanging or you have kids that just got a little too rough. Patching a hole is pretty easy. Use some spackle and spackling knife and fill that baby in. Use sandpaper to even it out and put another coat on until you can no longer see or feel the hole. Just paint it once it’s dry and you’re done! If you find that your disposal is clogged, make sure there isn’t anything down there that can’t be chopped up, like silverware. Or olive or cherry pits. Make sure you cut the power before you stick your hand or anything else down there! If it’s all clear, use an Allen wrench (usually you get one with your disposal) and put it in the small hole on the bottom of the disposal. Turning it from side to side will loosen the clog and get the disposal back to working properly. Have a squeaky door that drives you crazy? All you need in order to banish that squeak is a little WD40. Spray this on the hinges and enjoy silence each time you open and close your door. Quick reminder. Be sure to keep your work tools in the best tool cabinets out there. You can get these cabinets not only in a variety of sizes, but also in a rainbow of colors as well. Ready to Take on Your Home Repairs? 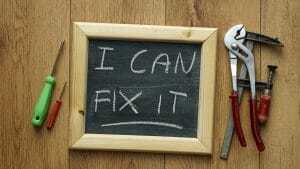 Do you feel confident in your home repair skills? I hope so! Not only will you save yourself money, you’ll also get the feeling of accomplishment when you do the repairs on your own. You can check out some of our other DIY tutorials. From painting furniture to refinishing your floors, there’s a project here for everyone.